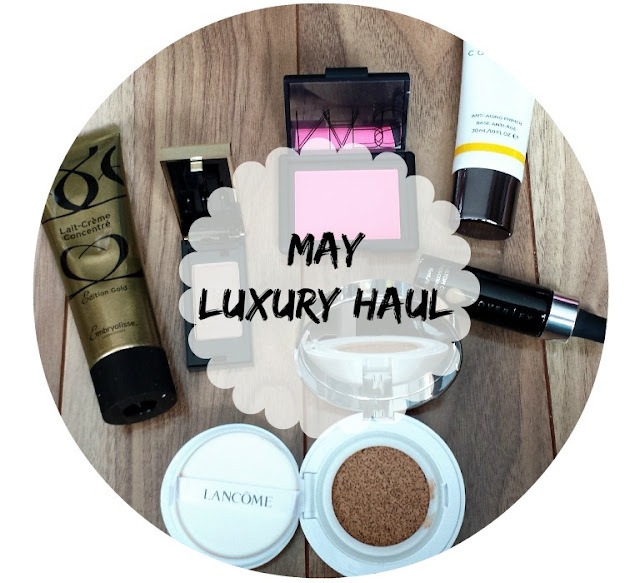 I know, I know, it's already June but I couldn't forget to post my luxury haul goodies from May with you all. 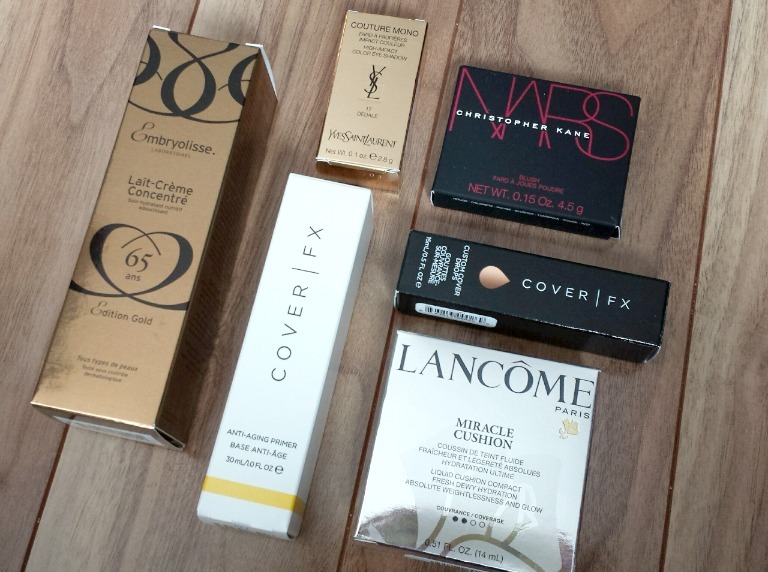 The good thing however though, is that I have tried out some of the products so I can include a mini review of my thoughts on the products I've tried. I will also do a more thorough review later on. I have often loved the Giorgio Armani Luminous Silk foundation based on how sheer of a coverage you get and how lightweight it feels on the skin. Even though the coverage is sheer, you always end up looking airbrushed and I loved that about the GA foundation. This Miracle Cushion Foundation acts in the same way - light coverage, but buildable and feels lightweight on your skin. What I particularly favor in this product is its portable package. 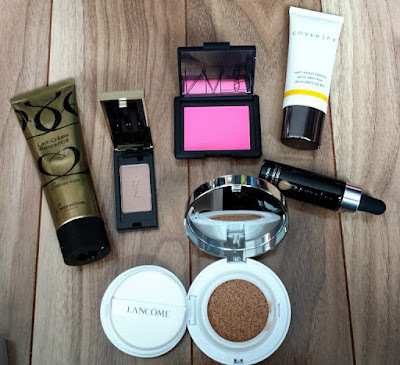 I know that cushion foundations aren't new in the beauty world and Korea had them a few years ago however I was never able to find a match to my skintone, nor did I want to spend money taking a chance and buying a product that might not be a good fit. This is a perfect product for summer - its quick to apply and I can take it around with me for touch-ups. YouTube kills my wallet. I got this due to Tati's recommendation as she loved mixing this with the Cover FX Custom Drops. I have to say however, that I love how this comes in a slight yellow tint. It gives a blurring effect to the skin and on days where I want to do a light powder dusting and cut out my full foundation routine, I use this as a base and it sufficiently diffuses the slight discoloration on my skin and blurs out the pores. When mixed with the Cover FX drops, it had the consistency of a light serum which made application quick and easy. I love the concept of this product. Pure pigments which allows you to mix it in with anything to create your perfect foundation. Mix it in lotion, to create a tinted moisturizer. Dilute it with a serum, primer or oil to have a foundation with added benefits. And finally, adding this to your current foundation that is either too dark/light for you for color correction. They say you need 2-3 drops for a full face application, however I can get away with one drop mixed with the primer above, for a sheer coverage. I am not one for heavy foundation (i.e. the Estee Lauder Double Wear look), so this is perfect! This foundation is perfect for pictures as well! No white casts! What luxury items have you bought this month? I would love to hear from you! The cushion foundation seems so interesting. I don't follow Asian beauty all that much, but it seems so innovative! Great products! I'll be interested to read what you think about the NARS Christopher Kane blush. I love NARS! Wow, that Christopher Kane blush is insane!!!!!! I'm shocked you didn't go more in-depth on the Embryolisse, I am looking forward to more of your fantastic reviews.